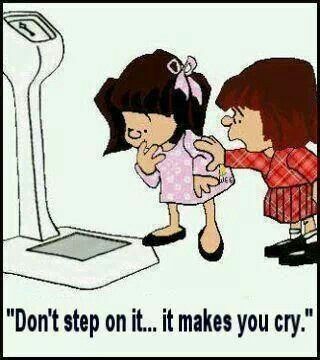 The scale is a double-edged sword. When it’s saying what you think that it should, it’s your friend and motivator. When it’s not saying what you want, it’s your nemesis. A patient of mine, years ago, was doing a dieting ‘points program’. She was eating well, moving her body more, and at first, losing a bit of weight. Then after a couple of months, she started gaining. Each week she was adding weight. When I asked her how much, she said, “about 0.2 lbs. each week.” Huh? So, over the course of the summer, she had tormented herself. Desperately trying to figure out what she was doing wrong and she was angry at her body for not responding to her actions. At 0.2 lbs. per week, she had only gained 2 lbs. over the whole summer. TWO POUNDS! Despite the fact that she was eating nutritious foods and moving her body more often, she still felt like a failure. Please understand that health and weight are not synonymous. I know that we’ve all been told that they are for decades, but we now know that it simply isn’t so. I will back that statement up in a moment, stay with me here. Get clear on what your real goal is – health or weight? If it’s really about health, then why are other measures not as important? What about mental health? Clearly this patient’s mental health had been compromised during this process. She felt defeated. She felt like a failure. Her body dissatisfaction rose each week. And I give her kudos because she didn’t quit as a result of her perceived failure. But it sure did a number on her self-esteem. In my Naturopathic practice I work with many fertility patients. There is a study that I quote regularly to them. Two groups of obese woman were observed before IVF (in vitro fertilization.) One group exercised regularly, one group did not. Neither group lost weight and no changes in BMI were noted, as this was NOT a weight loss study. However, not only did the exercisers have more pregnancies, more importantly, they had more live births (take home babies.) To the tune of 24% live births in the exercisers versus 7% in the non-exercisers! What can be so damaging about measuring weight as the success outcome, is that many of these women would have given up on exercising when their body didn’t change. And that means that they would’ve missed out on the positive HEALTH outcome. Or they may have compromised their mental health while sticking to it. Did you know that being overweight is actually associated with LOWER mortality rates? Yes, you heard me correctly. Being overweight leads to better health outcomes. What? That’s not what we’ve been told. So, get clear on what your goals are. Is it really about your body size? If it is, that’s fine. But don’t go around saying that it’s about health, because it’s not. If you’re really about improving your health, then measure health, not size. What you can measure instead of your size? You can measure, by tracking, how many times you moved your body and meditated. The more consistently you do this, the more on track you are. Both of these activities lead to better health outcomes. You can keep track of your energy, sleep, and mood. All are measures of health. You can keep track of how many days you honoured your basic needs like going to the bathroom when you had to, or eating regularly spaced meals. Endurance – Can you walk longer, do more push ups, hold plank longer? These are all good indicators that you are on track. There are so many ways to determine if you are moving towards health. Weight is tremendously low on the list of useful tools. What will you start to measure instead of your weight? Who would be willing to share here in the comments? Really motivating article for people like me.. Thanks Sarah. I’m so pleased that it was useful for you!